The Espresso Compass is a little more complicated than the Brewed Coffee Compass. Last year I wrote a series on Espresso, culminating in a video showing the relationship between extraction, brew ratio, and the coffee control chart. If you’re on top of that, you’ll get this compass in no time. If not, I recommend reading my posts on espresso Dose, Yield, Time and the video ‘Putting it All Together’. The Espresso Compass is at an angle because I wanted to keep the usual x/y orientation of Extraction and Strength as they are found on the coffee control chart. Each slice of the triangle shows the flavours you can move through when adjusting yield. Increasing yield will make the espresso simultaneously weaker and more extracted. Reducing yield will make the espresso simultaneously stronger and less extracted. Moving to a different slice requires changing grind setting and extraction evenness. In lower and less even extractions, you’ll notice that over (red) and under-extraction (yellow) are much closer together and the sweet spot (green) is smaller. If you’ve ever had a simultaneously bitter, sour, and low strength espresso it was likely sitting in the lower left slice. The more you improve and increase your extraction, the further away from that hell you will be. More even extractions have a much larger sweet spot that tastes more like the coffee itself, and less like the taints of poor extraction. Note: increasing extraction can only really be done in conjunction with improving its evenness. Grinding finer and finer does not result in a continuous increase in extraction, and it certainly doesn’t always result in more deliciousness. A lot of the time it results in the exact opposite. For more on this, read up on the law of limiting returns in espresso here. YES!!! Thank you so much for this. My new phone background! Cool stuff. Coincidentally, I’m working on an interactive version of this (meant to be a barista training tool), but it’ll be a while before I’ve wrapped my head around all the parameters. May I ask, how do you check the development of a roast so one could determine if it is a well developed one or not. Just to confirm I understand the chart, if you have SOUR the only thing you can do is increase yield? Is that what it is saying? (I realize that increasing temperature should or may reduce sourness). If you don’t have a lazy $2,500… break a bean open and see if there’s a noticeable difference in colour, it’ll be lighter on the inside of the bean and probably harder to break open… you can also chew on a bean, if it’s guaranteed fresh and properly stored but chewy, another sign it could be underdeveloped. No, if you travel from lower left to upper right (by grinding finer, for example) you go from sour to strong-substantial to plump-transparent. Yeah. I considered adding water temp but thought it was already too confusing. Especially after the simplicity of last week. Maybe a 3rd dimension or modified chart will make its way out soon! That’s pretty much the gist of it, yeah! I will translate this in French for my Caffeinated Frog Buddies! I will so take you up on that! Thanks for the (much appreciated) offer, will get back to you! Hope roasters can share their thoughts on this one. As it will really help all on the specialty industry! Tough one. Turns out a very large portion of the specialty industry has no idea – if they did there’d be a lot less underdevelopment going on! Hi, I stumbled upon your site a week or so ago and went through pretty much all of it’s content. Just want to say great work. It’s defintily the best source of information around on the web, concise, complexe enought and complete. You should think about making a book !! Thanks again and keep up the awesome work ! Another great read. I love how when it comes to espresso you consistently bring up the importance of focusing on extraction which is something that in my personal experience is missing/misunderstood in a lot of Barista training. Someone needs to make “The Taints of Poor Extraction” into a book. Appreciate what you do Matt. 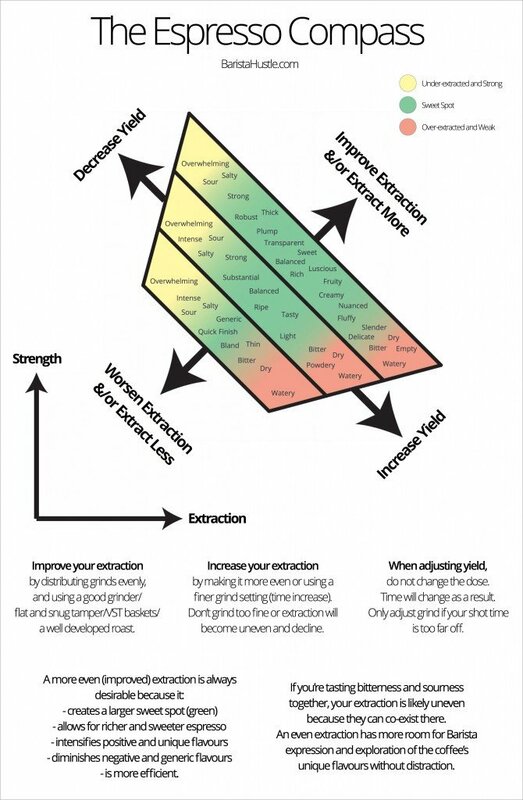 I was confused when I first studied this chart and read the commentary; but it was easy to follow in actual use and, most important, helped me quickly improved the taste of my expresso. About underdeveloped roast isn’t it that if coffee is developed enough so it is easier to brew it in enough TDS and extraction yeld level in shorter time with the same temperature, grind size and when it is underdeveloped it is harder or even not possible to do it with the same settings and temperature ? A really interesting read – I’d be interested read about the cleaning agents and taint from them. I only use bi carb in my groups to clean, and rinse really well, and I find I get a greener flavour afterwards. If I don’t clean every day, I get towards the red zone. I’ve tried a descaling treatment, and found a strong yellow zone flavour. This is exactly the sort of information I have been searching for! I’m currently a home enthusiast but working towards getting in to the coffee industry. Most tutorials and videos are aimed at the novice but there is nothing in the middle so to speak so thanks for this. I also enjoyed and appreciated the video on YouTube going in to more depth on tuning your espresso. Hi, i was wrong so. well when you want to go to improve extraction/extract more you must extract more coffee more of your coffe so you need to grind finer or maybe improve your temprature by going up so you can take more soluble solids=strength but always that depends its a general answer just think of that : taste and see where you wanna go on your compass but yes the answer i think was pretty clear . hope it helps . Just to be sure i understand it well, if i want to see where the fact to grind finer or coarser will be placed on you Compass, it will be grind coarser on “Improve extraction &/or extract more” and grind finer on the opposite side ?